Obesity is associated with a chronic inflammatory state and increased risk for cardiovascular disease. We hypothesize that gastric bypass is associated with rapid improvements in inflammatory mediators and cardiovascular risk. We performed a prospective pilot study of morbidly obese patients who underwent laparoscopic Roux-en-Y gastric bypass. Patient demographics, clinical data and biochemical markers related to inflammation and cardiovascular risk were documented (i.e. fibrinogen, C-reactive protein, TNF-alpha, PAI-1, IL-6, IL-10, IL-1Ra, adiponectin, leptin, triglycerides, total cholesterol, HDL, LDL, glucose, insulin, HbA1c). Framingham cardiovascular risk score was calculated. Above parameters were gathered pre-operatively and at 3 and 6 months post-operatively. Fifteen patients (11 female) were included in the study with a mean age of 49.3 years, average body mass index of 48.1 ± 5.3. At 6 months, the mean BMI decreased to 35.4 ± 4.5 corresponding to 51.7% excess weight loss. The mean waist circumference decreased significantly from 132 cm to 110 cm at 3 months (p 0.003) and 107 at 6 months (p 0.0001). At 3 months, there was a significant decrease in the pro-inflammatory markers CRP (p 0.01) and leptin (p 0.005) while the anti-inflammatory mediator adiponectin was increased (p 0.002). Also, triglyceride, total cholesterol and LDL cholesterol were all significantly decreased (p 0.01, 0.006, 0.011). At 6 months, there were significant reductions in CRP (p 0.0008) and fibrinogen (p 0.047). The other pro-inflammatory markers such as PAI-1, TNF and IL-6 were decreased but did not reach statistical significance. Leptin and insulin were significantly decreased (p 0.005 and 0.006 respectively). IL-10 was increased at 3 months (NS) but not at 6 months. IL-1Ra decreased significantly at 6 months (p 0.006). Adiponectin continued to increase at 6 months (p 0.004). Relative risk for 10-year coronary heart disease based on Framingham risk score was significantly improved at 6 months (1.69 ± 0.20 vs. 1.118 ± 0.20, p 0.005). 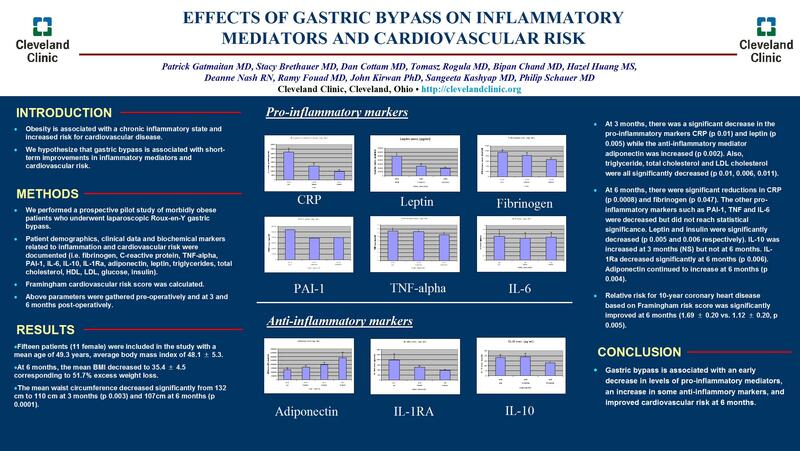 Gastric bypass is associated with an early decrease in levels of pro-inflammatory mediators, an increase in some anti-inflammory markers, and improved cardiovascular risk at 6 months.